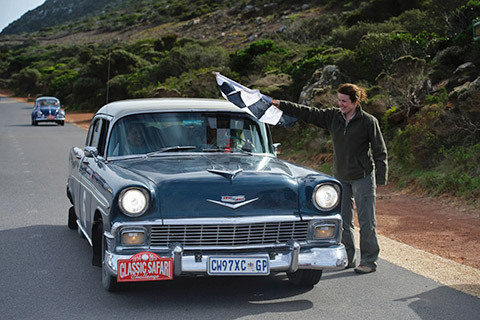 Day 25: Clanwilliam to Cape of Good Hope - We left after our final breakfast together to drive the last section of the rally back to Cape Town, aiming for the very last time control of the event sited on the cliff top of the Cape of Good Hope. Cars arrived at the southernmost point of Africa to be greeted by bus loads of surprised tourists... and a troop of curious baboons. Some crews only just made it - the big heavy Chevrolet Bel Air was making sickening grinding noises as it finally pulled up, the Volvo of Marco Halter from Switzerland arrived with the clutch virtually burnt out, and the Haslam's got to the finish in their XK Jaguar minus top gear. 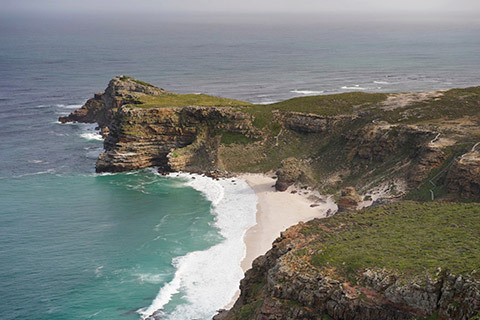 Drivers took in the sea air and met up with each other for a clifftop lunch with stunning views of the confluence of the Indian and Atlantic Oceans. Our route today had taken in the ruggedly beautiful Cederberg Mountains which have featured on our past events but this time organised with slack timing so all could fully appreciate the scenery in the early morning light. Crews spent the afternoon at their leisure, exploring the Cape and making their way back to the splendours the Cape Grace Hotel on the Waterfront. A prize-giving tonight saw a night section in the famous quayside bar which boasts possibly the finest range of whiskies south of Gleneagles with no less than 100 different malts lining the front of the mirrored shelves. Dusty and dirty, the line-up of cars opposite the polished railings of one of one of the best hotels on the African Continent makes an incongruous contrast, and all looking very different to the line-up at the start of this marathon road trip 25 days ago. Trophies have been presented to Dennis and Kathy Varni for best overall performance in his Ford Falcon, Mike and Eunice McInerney qualified in second spot, surely the best drive we have ever seen by a Ford Mustang crew, and third place was taken by the determined effort by the de Sousa's Volvo, with fourth place secured by the Lancia Fulvia driver Gianmaria Aghem. The best performing Vintage crew has been the hard-charging Bruce and Judy Washington in their Dodge, who set a pace which was regularly out-gunning many of the later cars in the Classics Class, however, while this car is undoubtedly rapid, the crew collected a penalty for missing a time trial following a breakdown, so the Vintage Class trophy went to the William Medcalf-prepared Bentley of Keith and Nora Ashworth, who enjoyed a very reliable run. Second Vintageant trophy went to the Dodge crew, and third place went to the Lagonda of Peter Lambert and Linda Lotriet. The unmodified Lagonda, still with its original 1930s leather seats has driven this vast loop of Southern Africa with remarkable reliability. Its troubles have been confined to a dented wheel rim - repaired overnight by our Andy Inskip - and a broken headlight. The Spirit of the Rally Award went to Nicholas Pryor and Leslie Stockwell in their venerable Volvo, against All Odds was Salome and Scott Pouroulis, who nursed the heavy Chevy Bel Air daily, and the True Grit Trophy went Andrew and Gina Long for their efforts with the ill-fated 1928 Crossley. The sweep mechanics presented two awards for two crews who drove such reliable cars that their help was not required - the MGB of John and Marian Crighton, and David and Julia Harrison in their purple Porsche 356. Amid all the joyous celebrations on our final day came one piece of very sad news - our central organising genius who has assisted the E.R.A. in many African events, Bob Whalley, died earlier today after a long illness. Bob worked on the hotel bookings and provided much inside advice to help refine our events from his Jo'burg office for over ten years, including all five Classic Safaris, and the first ever London to Cape Town World Cup Rally. He also helped the planning of our Fiat Panda record run last year which took two World Records for driving non-stop the length of Africa. Without slick logistical planning the record held by the British Army for 21 years would not have been broken.